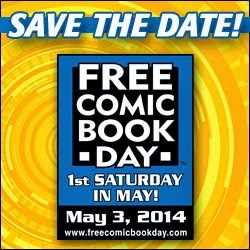 Come Celebrate Free Comic Book Day at Most Excellent in Enfield, CT! Ahem. Sorry, I slipped into my monster truck commercial voiceover guy persona for a second. This Saturday is Free Comic Book Day, and shops around the country will be celebrating with in-store events and free giveaways. My Secret Identity podcast partner Matt Herring and I will be hanging out at our local comic shop, along with some of our creator friends as well. I will also have copies of my books for sale, including Making Ear Candy: The Audio Confectioner's Guide to Podcasting, which I wrote based on my experiences producing Secret Identity for more than seven years. 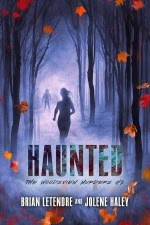 You can check out a trailer for the book below and find out more on the Making Ear Candy Page. Ironically, just after we recorded an episode of Secret Identity where I was talking about the positive aspects of Amazon buying ComiXology, this past weekend brought the first a decidedly negative result of that deal. That may not sound like a huge deal, but here's why it is. 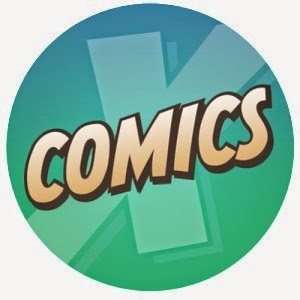 First, most comics that are bought through ComiXology are purchased through the iOS app. Secondly (and more importantly), the ability to make in-app purchases fosters a lot of impulse buying. You see a comic on sale, or finish a book and are thinking of grabbing the next issue, and with one touch, it's yours. That functionality is gone now, and a lot of that impulse buying is gone now, too. This will very likely lead to people trying out fewer new books, and an overall decline in digital comics sales altogether. That's bad. Man, I am fired up about this, in the best possible way. Once again, Mark Waid and the folks over at Thrillbent are making big moves on the digital comics front. On the Thrillbent blog this week, Waid announced the launch of a Thrillbent app for iOS and a new subscription model for the digital comics platform. 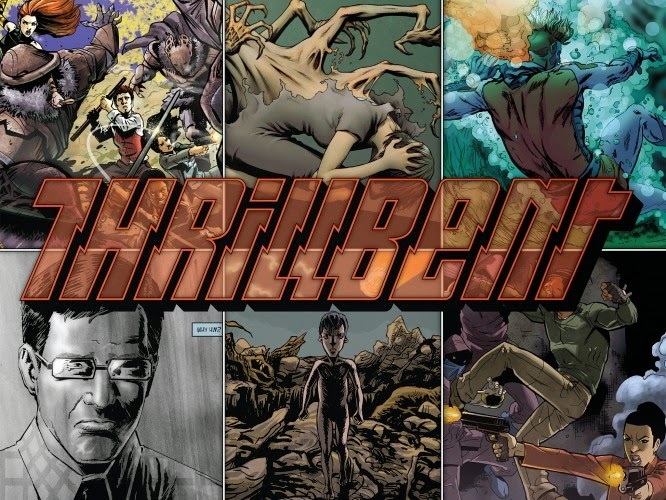 For $3.99 a month, readers will have access to all past and future comics on the Thrillbent website, many of which will be available only to subscribers. New comics will be available as they come out, unlike some other digital services (Marvel Unlimited, Netflix, Amazon Prime). While there will continue to be free content available on Thrillbent in the future, it sounds like creators will have the ability to decide how much of a given series is available for free, and how much becomes subscriber content. You can read all of the details over in the blog post, but I felt the need to post about this because of what I think Waid and company got right about this model. First of all, they did their homework. Thrillbent was launched two years ago, and from its inception, Waid was clear about experimenting with free and paid content, as well as the digital format itself, to try and find the best ways to get content to readers and compensate creators. There was a ton of free content put out during that time, including some of the best comics I’ve read in the past couple years (The Endling, The Eighth Seal, Moth City). They experimented with offering digital collections through their own storefront and through ComiXology. Some of those offerings had a “name your price” option, while larger bundles had set price points, which I found very reasonable. For example, you can grab the first 34 chapters (549 pages) of Mark Waid’s Insufferable for $14. So the decision for Thrillbent to move to a subscription model has not been made hastily. They did their homework, we as readers got tons of free content, and now they’ve figured out what the best direction is moving forward. I totally respect that. The most important piece of this equation though, is the single determining factor of the success of any digital initiative, in my mind--price point. And this is where I feel Thrillbent has absolutely nailed it. Their monthly subscription fee is $3.99, or the average price of a single print issue of a comic. I am a firm believer there is a magic price point for every type of content service, and the magic price point for this one is $3.99. It makes subscribing to Thrillbent the equivalent of an impulse buy. Because after what I’ve seen come through that platform over the past couple of years, I have absolutely no doubt whatsoever that I will get my $4 worth each and every month. I’ll probably get a great deal more, but I know I’ll get $4 worth. I trust Thrillbent because they have earned it. This is exciting. This has the potential to bring new readers into comics, and to get current readers to try something new. This is the type of thing that comic fans need to support. I am subscribing, and I really hope this thing catches fire, as I think it has wide-ranging implications for the future of digital comics. 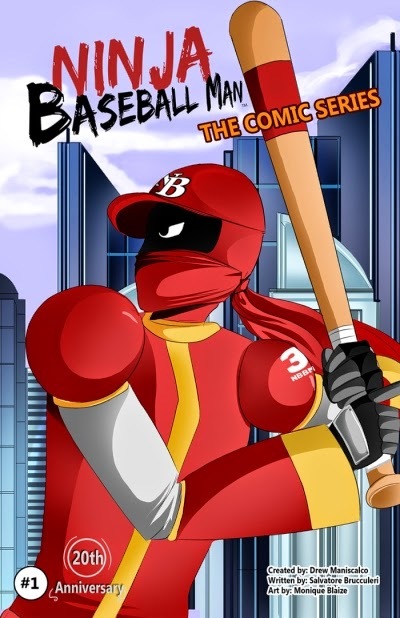 In the eighteenth episode of See Brian Write, comic writer Sal Brucculeri joins me to his various projects, including Soul Men and Ninja Baseball Man, which has a Kickstarter project going right now. I also discuss finishing the first draft of Lovecraft's Pupil during Camp NaNoWrimo. Slaying the Beast: The First Draft of LOVECRAFT'S PUPIL is Finished! That was the moment I finished the first draft of Lovecraft’s Pupil, the sequel to Lovecraft’s Curse, and the book I began working on in November of 2013. I cannot tell you how amazing it feels to bring a story to the finish line, even in first draft form. If you’re a writer, you know this feeling, and I’m sure you would agree it’s one of the reasons we write in the first place. I am really happy with how this particular story ends, too. As I mentioned in my last post, writing an ending is arguably the most difficult part of writing a story. And this particular ending I have been puzzling over in my mind for weeks now. I had it narrowed down to a couple of possibilities, but until I sat down for the final writing session, I had not completely decided on how this book would end. Once I locked in though, the words just flowed, and I knew this was the right way to bring this chapter of Fela Barton’s story to a close. I actually got a chill when wrote the last couple of sentences and played the scene out in my mind. Best of all though, I have a really solid idea of where the next book will be going, so much so that I’ve already started outlining chapters. I’ve left each of the characters in a place where I’m excited to write about what happens next with them, and the overall arc of the series is in a great place as well. 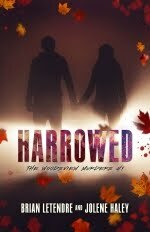 Next up, the editing process begins, and I already know there are several parts of this story I want to re-work and tweak to make them fit together better. But for the next few days, I’m going to bask in the glory of having finished this first draft. Because it was a beast--and I slayed it. Think about the last few books you read. Or a television show you really love that aired its season or series finale. 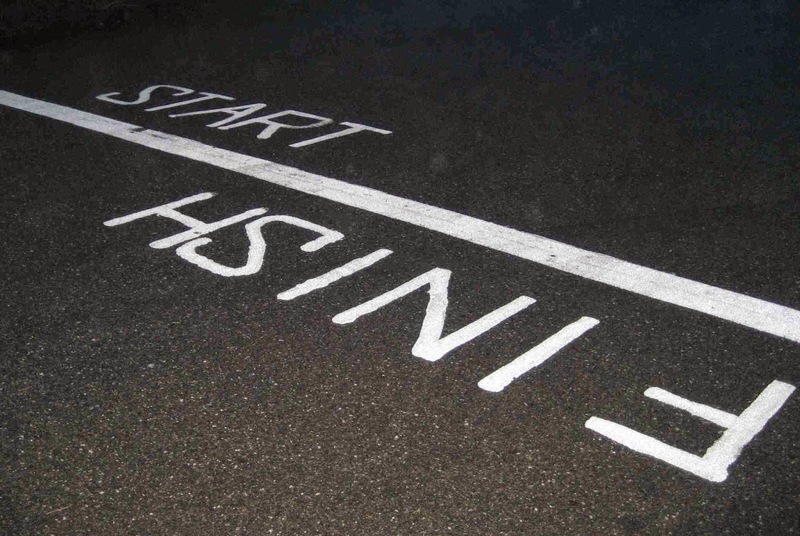 There's a good chance that half of the things you just thought of had endings that were less than satisfactory to you. And while some of the stories you love might have endings that completely stink, it's not necessarily because the creators behind them are incompetent halfwits. It's because endings are freaking hard to write. And for me, it's one of those things where once you actually go through the process of writing an ending yourself, you whole perspective on that component of storytelling changes. 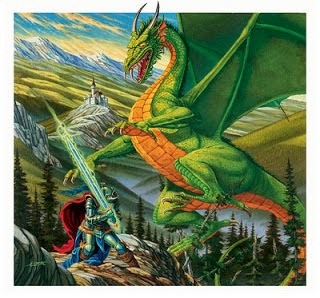 Writing an ending to a book in a continuing series provides its own unique challenges and opportunities. I am finding this out right now as I write the final chapters of Lovecraft's Pupil and continue to plan the next book in the series. My challenge is to give readers some resolve at the end of the current story, while throwing open the door to the next story in the series. It's like having a pint of ice cream and wanting to save some for later. How much do I give the reader now, and how much do I leave for later? 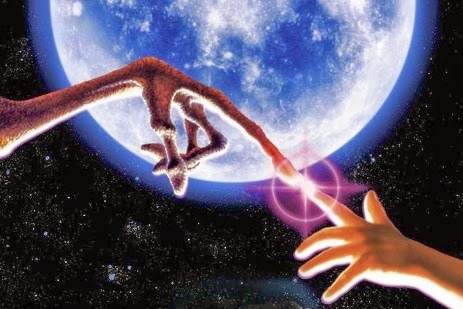 So, my approach is basically to give the reader more now, because I am ultimately in control of what happens later, and readers will not move on to the next book in the series if they feel short-changed with the current entry. But I've made sure to leave a healthy portion of that ice cream for later, because that also keeps me excited about writing the next installment of the series. I know I'm kind of babbling, as I am wont to do on some of these process posts, but I've been thinking a lot about endings between writing Lovecraft's Pupil and watching some of the season and series finales on TV recently. No matter what the medium, I applaud anyone who crafts an even remotely satisfying ending to a story. Support Your Local Music Shop on 'Record Store Day'--Saturday 4/19! If you're thirty-something or older, there's a good chance you bought your music growing up at a local record store. And while the digital age has meant that the bulk of music is purchased online today, there are still about 1000 independent music shops in the U.S alone. This Saturday April 19th is Record Store Day, a day to celebrate and support those local music stores who are still out there providing a physical place for music lovers to buy and discover music, as well as hang out and talk about the music they love. I am very fortunate that the music store I grew up with is still in existence today. Music Outlet in Enfield, CT is where my love of '80s rock and metal was nurtured. In high school I worked at the Stop&Shop next door the Music Outlet, and my weekly check would be cashed and the spent picking up new releases, rare imports and merchandise like jean jacket patches at the shop. The store has moved a couple times over the years, but it's till going strong, and it's still run by Gary, the same guy I bought my first cassette tape from decades ago. There are a bunch of exclusive releases that shops may be carrying for Record Store Day, most of them on vinyl. From Motorhead to Notorius B.I.G., there is something for fans of just about every genre. You should call your local store to see exactly what they are carrying. You can find participating stores near you here. So go out and support your local independent music store this Saturday! 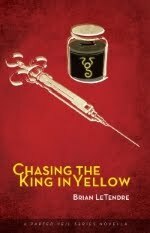 COURTING THE KING IN YELLOW is Part of a Cthulhu-Themed Bundle at Drive Thru! My first novel Courting the King in Yellow is in some great company this week, as it's part of the "Cthulhu Mythos Bundle" over at Drive Thru Fiction. 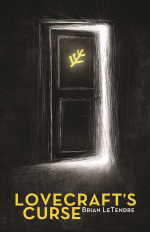 The bundle includes ten items that feature everything from Lovecraft anthologies to concept albums, and there's some great King in Yellow-themed content as well. If you're a fan of either Robert W. Chambers or H.P. Lovecraft, there is a lot of great stuff for you to dig into with this bundle. The bundle costs $35, and you end up saving about $20 off of what you'd pay to download everything separately. Thanks to Drive Thru for their continued support of my work! When it comes to reading comments and reviews, I know some writers who avoid them like the plague, and others who feel they are essential in terms of feedback. I probably fall somewhere in the middle of that spectrum. I appreciate when someone takes time to post a comment or review about something I've written, but I try not to get too high or low based on what they have to say. I'm just glad they took the time to read my work, and I'm even happier if they were entertained. In terms of feedback, the most valuable thing to me as a writer is when a reader connects with a story or character I created, and wants to interact with me about it. I had a great experience recently I wanted to share. 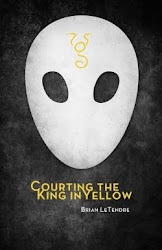 Someone I know read Courting the King in Yellow a couple weeks ago and wanted to process the story with me afterward. 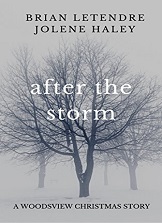 She had questions about the events and characters that went beyond the book, and was genuinely interested in what happened before and after the story I had written. It just so happened that one of the characters that clicked with her the most was Nita Young, who I gave a supporting role in CtKiY, but revisited in the short story Private Showing. She read that story and became even more invested in the character, leading to another great discussion and many more questions. Some of those questions were answered in my second book Lovecraft's Curse, and some are being answered right now in the book I'm currently writing. In fact, I happened to be writing a scene with Nita in it at the time, and was delving deeper into an area this reader was asking about. I'm babbling a bit, but the point is this--that series of discussions with that one reader was so amazingly validating. I don't know that readers realize what a profound effect they can have on a writer. As much as we say that we write for ourselves, and we don't pay attention to the bad stuff, we all hope that the things we write will connect with someone who reads them. And when that connection occurs, and that reader lets us know--there's no other feeling like it. The motivation that type of interaction provides can't be found anywhere else. At least for me, anyway. So, if you've taken the time to read a story I've written, thank you. And if you really connected with something in that story, I'd love to hear about it. You may even give me some ideas about where to take things next! I’m four days into Camp NaNoWriMo, and it’s already a huge success for me. This morning I wrote a scene in my latest book that I’ve been puzzling over for months. As I’ve mentioned, I am finishing the draft of the sequel to Lovecraft’s Curse, a huge chunk of which I wrote during NaNoWrimo this past November. This scene involved a fight with the big bad of my book, and I’m pretty happy with how this first draft of it came out. So, I’m back on track with my book and it’s awesome. But what’s even more awesome is what being in a writing frame of mind does for my creativity. Without fail, whenever I am immersed in a writing project, I come up with the ideas for my future projects. Today, I came up with the idea and outline for a new book in the span of about thirty minutes. I wasn’t planning on this particular project at all, but since I’ve been writing regularly again, a certain corner of my mind is smashing ideas together like a supercollider. The idea for this book came together while I was sitting in a meeting, as it’s directly related to what we were meeting about. 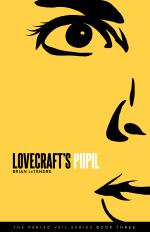 I may decide to start this new project for Camp NaNoWrimo in July, but right now I need to get back to Lovecraft’s Pupil. I'm Heading to CT HorrorFest in August! I am very happy to announce that on August 23, 2014 I will be attending CT HorrorFest in Waterbury, Connecticut! The show is being organized by Christine Caprilozzi and the rest of the great crew from the Horror News Network. Among the announced guests so far are the original Michael Meyers Tony Moran, The Walking Dead's Robert "IronE" Singleton and Paranormal Activity's Micha Sloat. I will have a table at the show and will be selling copies of both Courting the King in Yellow and Lovecraft's Curse. I may also grab a few interviews for Secret Identity and the See Brian Write podcast. If you're in the area, you should definitely come out on August 23rd and celebrate horror with all of us. The show will be at the Courtyard Marriott in Waterbury, and you can order tickets by heading to horrornewsnetwork.net/ct-horror.